Here is my latest project. I need to make 21 blocks for a block exchange for a quilt retreat that I am attending in late October. This is the block that I have designed. The background fabric is the "Lodge" color of the Thimbleberries club quilt. 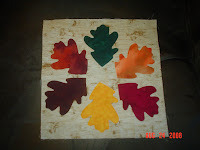 I knew I would applique on leaves, but at first I wasn't sure how many I would put on each block. Originally, I was planning on 4 leaves, but it looked a little "sparse" with only 4 leaves. So, I now have six leaves -- good thing I purchased 6 colors for the leaves. I have about 4/6ths of the leaves traced and cut. I will be using the buttonhole stitch, sewn by hand, on all the leaves. I am about to start that process as my fingers are very sore from cutting leaves! The theme of our blocks had to center around fall, camping, the lake, the woods, or cabin-life. When I get to retreat in the fall, I will exchange my blocks with 19 others. We are going to donate 1 block each to the resort where we hold the retreat as last year we were the first quilt retreat held at that resort. One of us will sew up the quilt for the resort and, hopefully, they will display it in the lodge.